Introducing the Audion Super Sterling KT120. World's first Single Ended KT120 Amplifier. Complete RAVE REVIEW in Part Time Audiophile, "I’m weak. I have a total crush on this amp. The Audion Super Sterling 120 is a wholly successful work of art that delivers everything you could hope from twenty-odd watts of tube power. Malachi Kenney, Part Time Audiophile Magazine. Read full Review here. This is quite stunning. The world's first Single Ended KT120 amplifier. Every designer said it couldn't be done. This tube wasn't designed for it and on and on. After a year we did it and the sound is amazing. The sweetness of the EL34 with twice the punch of the KT88. A perfect marriage. Pure Class A. The price is an introductory price so get your amp at a great price while it lasts. Of course its available with the optional remote and coming is the PSE and PP versions. Enough power to melt the walls. Yet, still stay in the superior sonics of Class A. 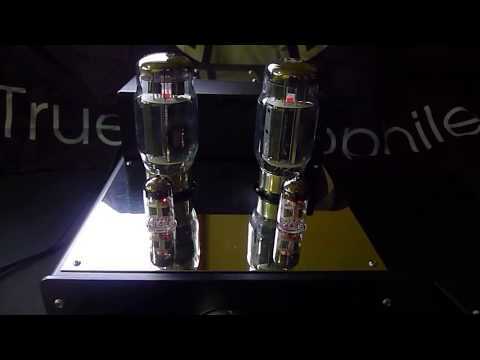 The Audion Super Sterling 120 uses Tungsol KT120 pentode tubes the amp delivers approx. 24 watts into an 8 ohm load. Therefore, it has the power of competitors boasting 35-45W. The amp has been designed to work with lower efficiency loudspeakers from approx 86db and up. Complete RAVE REVIEW in Part Time Audiophile, "I’m weak. I have a total crush on this amp. The Audion Super Sterling 120 is a wholly successful work of art that delivers everything you could hope from twenty-odd watts of tube power. Malachi Kenney. Full Review.